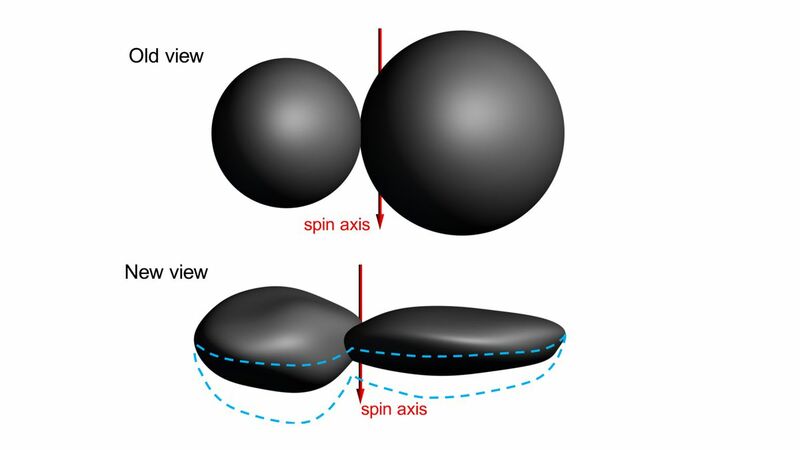 At first look, the mysterious area rock that NASA’s New Horizons zoomed by on New 12 months’s day appeared like a lumpy snowman, or perhaps a misshapen area peanut. Now, a brand new set of photographs reveal that the area rock is flatter than initially thought — extra pancake, actually, than peanut. The area rock, known as 2014 MU69, is positioned 4.1 billion miles away from Earth within the Kuiper Belt, an enormous stretch of frigid objects that orbit the Solar on the edges of the Photo voltaic System. Throughout its flyby of the 21-mile-wide rock, New Horizons snapped photographs with its two cameras and picked up 50 gigabits of knowledge with its onboard devices. Uncooked (left) and processed (proper) photographs of 2014 MU69 because the New Horizons area craft sped away.